I’ve been so inspired lately by the expressive artwork so many of you are making. I’m feeling the need to loosen up and make something with a bit of punch. 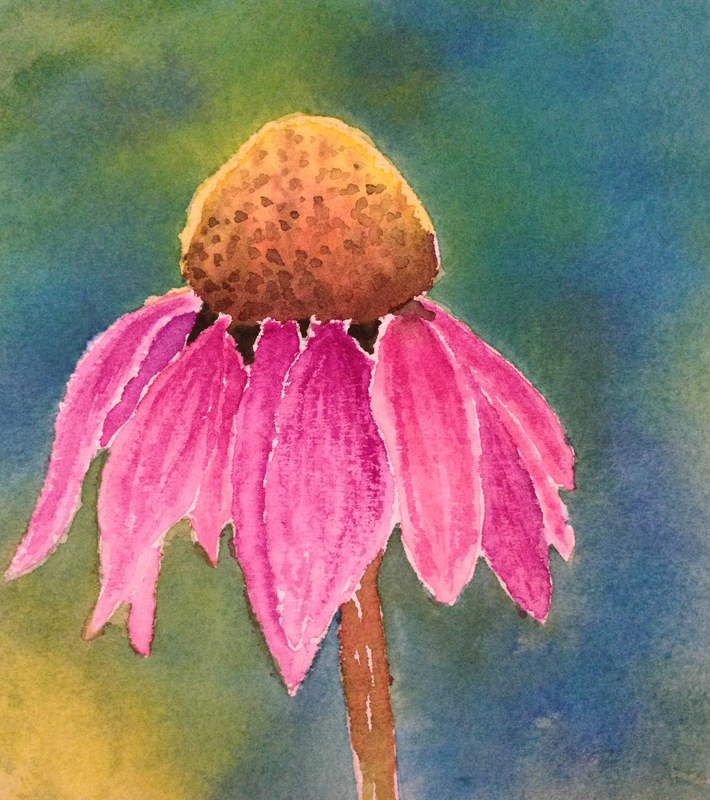 I searched “loose watercolor flowers” on YouTube and found this link from Deb Watson. Hub grows purple coneflowers, but they’re not yet blooming, and at Deb’s website, she was kind enough to share her reference image. Here is my first background wash. I kind of liked it, until I went on in the video and she reminded me to make sure the background is quite dark, to have a good contrast against the fairly light flower. 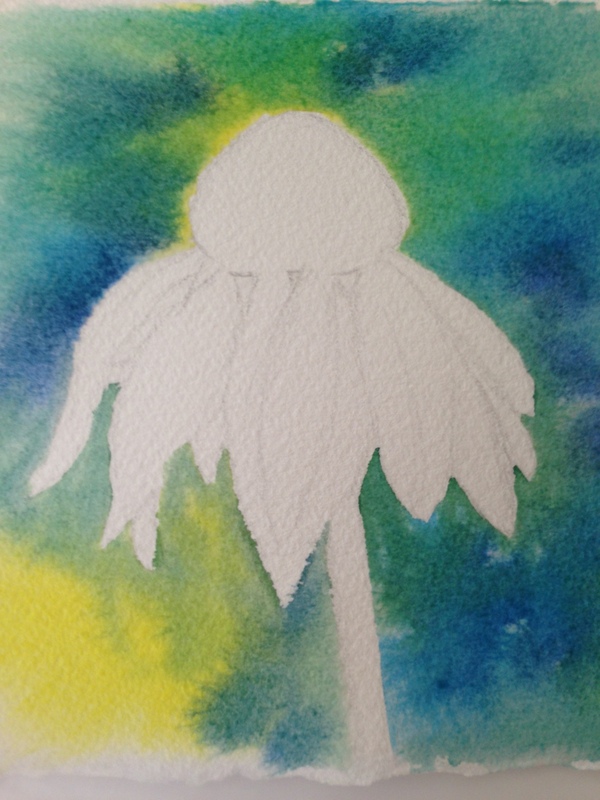 So after letting it dry (ahem, helping it along with a hair dryer), I wet the paper again (all but where I’d drawn in the flower) and laid in a deeper, darker wash. It’s not quite as psychedelic, but I do like the deep tones of M. Graham’s aureolin yellow, cobalt blue and phthalo blue together. My end product is quite different from hers, but mainly because I wanted the texture in the petals. Not sure if I should go back and soften them off a bit with clear water? The lines there may be a bit hard, but at this point, I’m happy with it. We’ll see what happens in the morning. The pink/purples I used are Graham’s quinacridone rose and Cotman’s mauve and a bit of dioxazine purple and a bit of WN Rose Madder. Who wants to dance?? I’m ready! Happy Friday, everyone. Tail feathers were meant for shakin’! Thanks, as always, for your visits and comments. Thanks, Nicola and I’m glad you like that part in particular because I was wondering if I should soften those lines. I like them too, even in the morning. Thanks for your comment. Also the bright yellow edge to the flower middle – it makes it seem like it’s glowing in the sun. It really does, and you’d be amazed how easy this was to do. It really helps me at this stage to follow WC tutorials. good on you for trying something that pushes the boundaries….it brought a reward! Thank you, Lance. It’s not often I’m happy with anything I do in watercolor, but I do like this little painting. I’m glad you like it as well. Perfect! Well done, my friend! Wow, thanks, C! I really appreciate that. It’s so much fun to see the process. I like the idea of drying the paint with a hairdryer…(now where is that thing, I know I have one) as I am usually too impatient to wait. Great flower texture, especially as a contrast to the dreamy background. Thank you, I appreciate that! Yeah, patience is a real problem for me too. Half the time I keep painting when I know I should stop and wind up wrecking the thing. Summer definitely helps, but the hair dryer is a valuable tool, even still. Thank you, Kirk. I actually like this one too. Happy Weekend to you! Kirk, I was remiss. Happy Father’s Day to you. Have a nice day. Planning and doing the background first really works! This is lovely – I’m too impatient so a hairdryer would work well for me also. Beautiful Laura – don’t change a thing. I love the texture and dimension of the flower. Thank you so much, Sharon!! I really appreciate that. So glad you like this. This is lovely – my word, you’re making progress so fast! Thanks, Rebecca! The key for me was giving myself permission to use the good paper. It’s so much harder to foul up now. Do you find this too? Yes, I think the paper is a massive contributor to success of any watercolour, and money well spent. Seems to be working for you! I noticed a huge difference when I switched from Strathmore watercolor cards that go for 33 cents each. It’s literally night and day. I never realized it’d be this different. I’d have done this months ago. Gorgeous. i love the background. Thank you Sue! Watercolor backgrounds are fun and it’s easy to make them beautiful as long as the colors you choose play well together. In this case the tutorial gave me great colors. I’m glad you like it! Oh, it’s beautiful! It’s funny how at the previous stages, I’m looking at it thinking “well, that’s pretty nice, but…” and then I get to the last image and am wowed by the beauty both of the flower and the flower against the blue-green background! Thanks, Teresa! Best part is it was so easy to do. I’ll be really glad when I feel like I can compose my own paintings without the help of books, tutorials, etc., but at least I’m getting the result I want while leaning on a tutorial for help. Switching to good paper is making this process soo much easier. Yeah but that paper is $$ and I wasn’t even sure I’d like WC. Or art lol! It took me a loooong time to make that “commitment”. I actually was told by an artist at Open Studio and I asked his opinion. Or else I may still be painting on that other stuff. But you’re right. Shouldn’t have waited. I hear ya. Good quality art supplies are really expensive! I’m glad you’ve taken it to the next level! and yes indeed, artists paper Does Help!! 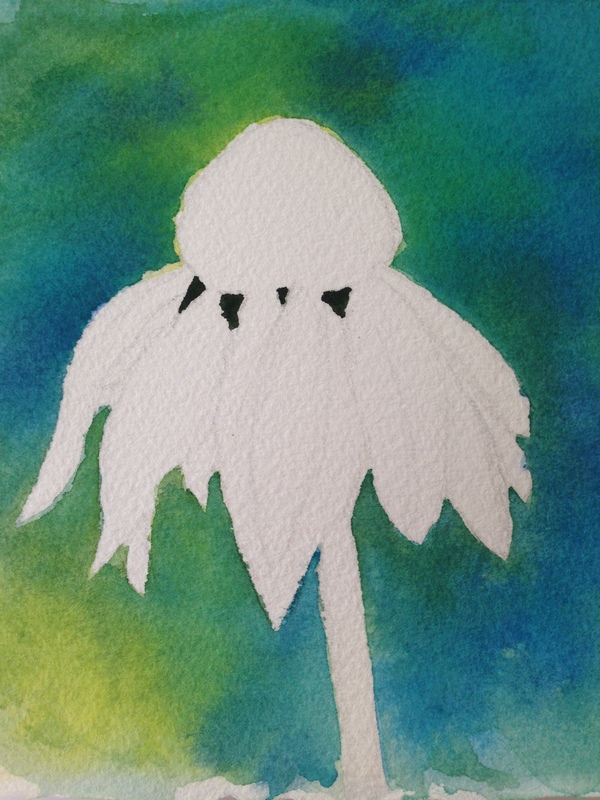 then you have enough variations of light, mid, dark tones on the flower to make it Just Right! Thanks, Debi! I really appreciate your visit and comment! I’d feel better if I could compose a painting like this with no tutorial for guidance. I probably need to reread your lessons. 🙂 Backgrounds especially are troublesome. I will try a few more flowers like this, I think. Thanks again! Thank you, Leslie! I hope my painting is improving so that my artwork will be more pleasant and enjoyable. Thanks so much for your visit and comment! I do appreciate it. I love the depth you achieved with much patience. It looks like a photograph. Thank you so much! If you feel like it, watch the video – she really does make it look easy, and I think for anyone with a little bit of WC experience, it is! That flower is also pretty easy to draw, which really helps. Thanks Carol, I actually like this one too. One of the few!! I’m glad you like it. The video tutorial is great!! Thank you very much! I really appreciate that! Hopefully, more to come in this vein. It’s beautiful! I want to watch the video. This is SUPER!!! So well done. I especially love the background. Kudos to you! Thanks, Rachel, but it’s all down to the youtube I referenced. I don’t feel like I can do backgrounds without guidance. I get all kerfuffled. Or whatever that word is. I wish I could feel like I was ready for the next stage….. I appreciate your comments, as always! I find backgrounds so much easier if I extend the subject out to some of the edges, in essence dividing the background into chunks. Then i mix plenty of the colors in puddles that are similar in consistency and have fun mingling them in the various sections. Hmm. Food for thought. Thanks.